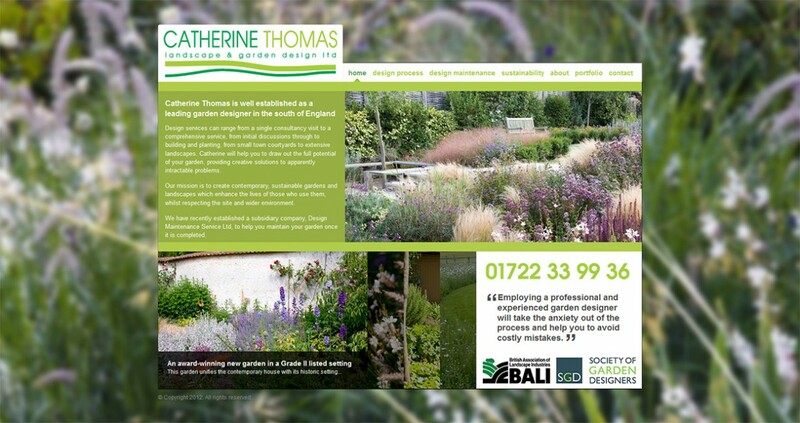 Catherine Thomas is well established as a leading garden designer in the south of England. Design services can range from a single consultancy visit to a comprehensive service, from initial discussions through to building and planting, from small town courtyards to extensive landscapes. We were approached to build a replacement for Catherine Thomas’ existing website which had successfully run for nearly a decade. The new website needed to be able to showcase the beautiful gardens to the best of its ability, taking visitors through Catherine’s work and introduce new services, but maintain Catherine’s strong brand. We built a modern HTML5 website for Catherine, which makes good use of space by incorporating dynamic sections which move, powerful background images and high quality galleries of images. The site has almost doubled in scope, so easy-to-use dropdown menus were incorporated, to be able to organise content across the site whilst keeping it easy to access. The site also features a dynamic portfolio page allowing viewers to jump between projects without leaving the page. Addison Design have been inspired, thorough and meticulous in creating a really stunning website for my landscape design company. They worked closely with me to ensure the website reflected every aspect of my business and it brings in significantly more enquiries than the previous website.